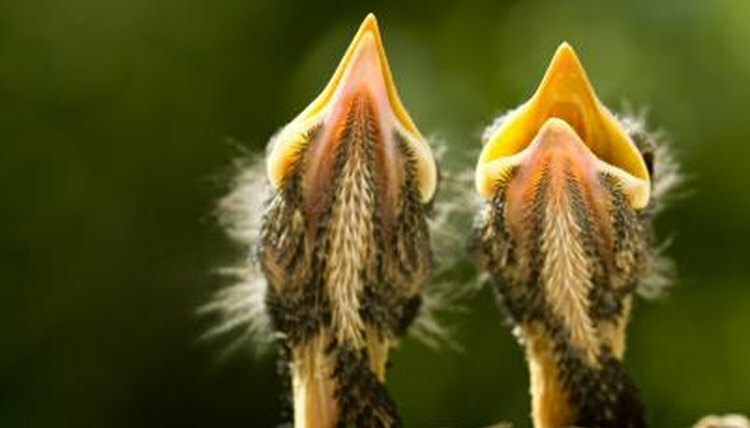 The fledgling stage is when birds begin learning to fly. It's common for young robins to end up on the ground, partly because fledglings have sparse feathers. If find see fledglings and determine they need your help, handle them properly and provide food that fulfills young robins' nutritional needs. If you see fledgling robins on the ground, step away, listen for chirping, and wait. Some fledglings fall when learning to fly, and they will likely chirp loudly for their parents in their confusion and possible pain. Watch the young birds for a half-hour to see if one or both parents come to the rescue of the fledgling robins. Do not intervene during the first half-hour unless a predator approaches the young birds. If a predator approaches or a half-hour passes, locate the nest and gently pick up the young birds one at a time. Put the young birds back in the nest, then watch for another half-hour. Give the robin parents every possible chance to take care of their young. Adult robins are not likely to leave fledglings for much longer than an hour, because fledglings need to feed at least every hour. Every hour, feed young robins three small mouthfuls of canned beef cat food, canned beef dog food, or bits of earthworm on the tip of a toothpick. Fledgling robins do not normally need water because the food they eat provides hydration; but if the fledglings are not eating right, put only a tiny drop of water on the tip of each bird's beak and let it run down into the bird's mouth. Never force water down a young bird's throat, as that can drown a young bird. If you cannot put the fledglings back in the nest and the parents do not come back, weigh whether you will be able to provide hourly feedings from sunup until sundown. If your schedule does not allow for hourly feedings, take the fledglings to a wildlife sanctuary. To transport young birds, put a soft cloth in the bottom of a lidded cardboard box with some air holes in the lid and some balled up tissues along the edges. To avoid injuring the fledgling robins, do not jostle the box during transportation. Wild Bird Care Centre: Baby Birds on the Ground - Are They in Need of Rescuing?